Thinking back over my recent blog on moving west, I realize I have missed an opportunity to make a point that tends to be missed when folks talk about statistics. I have just sat through a number of repeated meetings about education and school improvement in which people tried to compare complex distributions of students and subjects by comparing them with a single number. That single number was almost always an average of some kind, although the distinction between mean and median tends to be lost in the drive to have "a number" to use to compare distributions. It seems that people who would question anything you say will suddenly fall silent at statements like, "15 is more than 12, thus God exists." In the nation of the mathematically insecure, the person who quotes numbers has great power. Even if the numbers are purely "Potemkin" numbers created on the spur of the moment... "I have here in my hand a list of 205—a list of names that were made known to the Secretary of State as being members of the Communist Party and who nevertheless are still working and shaping policy in the State Department". We are a people in love with, and easily duped by statements of quantity. Averages are our favorite pieces of mis-information. But the center, the average location of population, for the 300,000,000 plus US citizens is in an empty field with the nearest residence over 100 yards away (my estimate, not an exact measure). 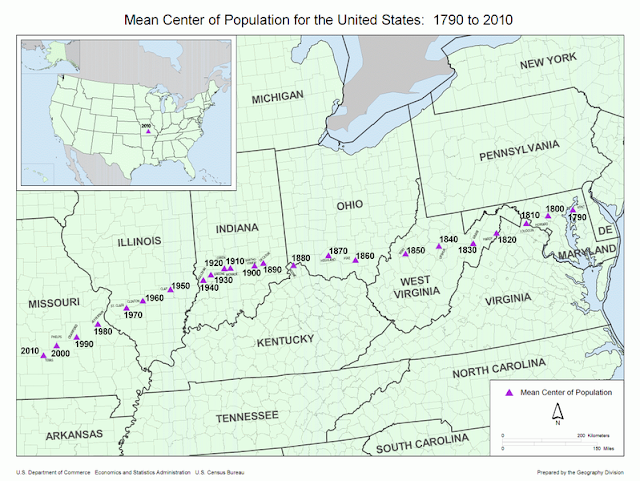 The center of mass of the US population is near a city with a population of about 65 people in an area with a population density of about ten persons per square mile. It is in some ways very typical of the wide planes areas to the west, which with exceptions in a few big cities have population densities from 0-10 persons per square mile. Only a few miles to the north-east, south-east or north-west the population density rises to over 1000 per square mile in St. Louis, Memphis, and Kansas City. About 1/3 of the total population of the United States lives in one of ten urban centers, and almost one in ten live in one of the two population centers of New York/Newark in the East and Los Angeles/Long Beach in the west. Both are a long way in both physical and metaphorical distance from the quiet little field south-west of Plato, Missouri. The US population that is nestled mostly in areas of high density is centered in a grassy field beside a tiny stream near a small quiet village in a very sparsely populated rural area. Centers are generally a weak measure to describe the great variability of a population in any measure. It's not that averages are bad... it's just that...well, averages ARE bad. 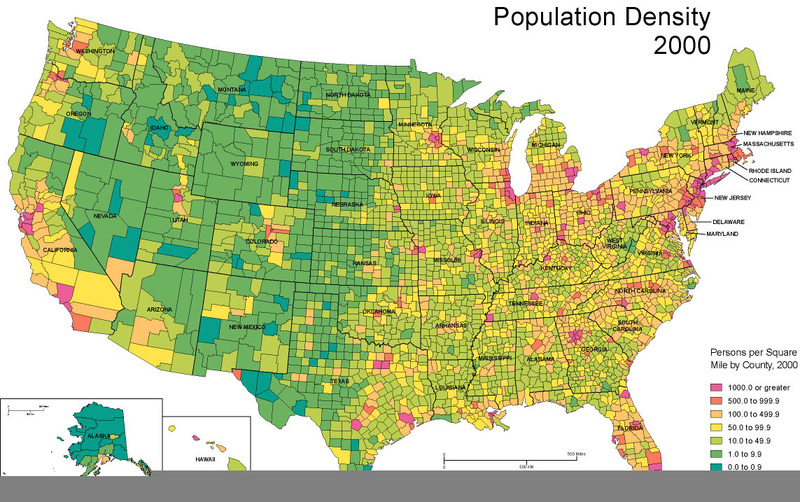 Every ten years a new population center of the country is determined by geographers at the Federal Census Bureau, using data from the latest recently completed national census. The official Center of Population for the USA is determined mathematically as the place where an imaginary, flat, weightless and rigid map of the United States would balance perfectly if all the 310,570,000 or so residents counted in the 2010 census were of identical weight. The previous official population center of the USA, based on the results of the 2000 US Census, is 2.8 miles east of Edgar Springs, Missouri. It moved 35 miles west-southwest from a point near Steelville, Missouri (its position determined by the 1990 census). The new Population Center, near Plato, is 25 miles southwest of Edgar Springs, reflecting the general migration of population from the wintery urban northeast to the sunbelt of the Southwest. Currently the federal government is working with local representatives at Plato to determine a location for a monument to mark the new center in a place that is accessible to the public. 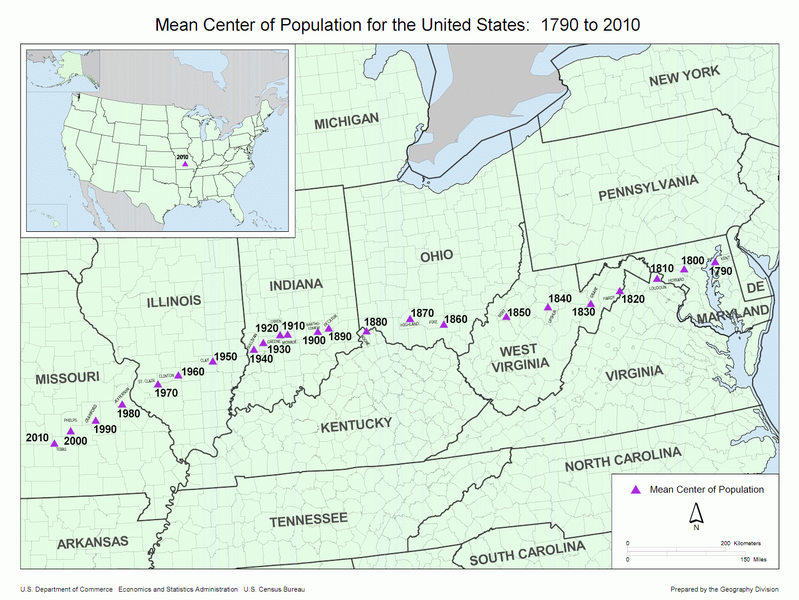 A nice map from Wikipedia shows the population center for every census since the first census in 1790. It raises several interesting questions for a multi-curricular investigation.. for example, note the change from 1920-1930 or 1940-1950 as compared to 1930-1940. Now I read "The Grapes of Wrath", and all those Okies heading west should have made a big jump, ...shouldn't it? But it seems prosperity brought a greater incentive to move west than poverty. And what accounts for the really small jump from 1910 to 1920? Yes there was a war on...but there was in the forties also. If you are interested in expanding this analysis, you might explore another site operated by USA Today which has separate offerings for population centers of various descriptions (whites, Blacks, American Indians (NOT Oklahoma if that was your guess)etc..). You can also pop open a page with statistics about the various states and the nation as a whole, but it doesn't include the 2010 census results. The data includes some interesting (read scary) data on poverty numbers by age.. So, the next time you are cruising west on 44 across Missouri, set the old Tom Tom on Plato, Missouri and swing by. Cannon's Cafe on Hwy 32 in Plato should have Coffee on, and if not Weber's is just up the road. Can't vouch for the pie yet, but when I go through they will almost certainly give me a big slice for free for this unsolicited plug. Are you listening Plato? I also found an animated link for US centers, but only up to 2000.. At the same site I found another animation for the MEDIAN center of population of the US. Very different type of motion, and the current median is located well east of the average position... still back in Indiana (although the 2010 census may put it over the line into Illinois, or maybe down into Kentucky... I'm rooting for a location that will be, like me, near beautiful Possom Trot, Ky. In Finland, the point of minimum aggregate travel is located in the municipality of Hauho. It is moving slightly to the west and south every year because people are moving out of the periphery areas of northern and eastern Finland. In Germany, the centroid of the population is located in Spangenberg, Hesse close to Kassel. A centre of population in Great Britain did not move much in the 20th century. In 1901, it was in Rodsley, Derbyshire and in 1911 in Longford. In 1971 it was at Newhall, South Derbyshire and in 2000, it was in Appleby Parva, Leicestershire. The centroid of population of Japan is in Gifu Prefecture, almost directly north of Nagoya city, and has been moving east south east for the past few decades. More recently, the only large regions in Japan with significant population growth have been in Greater Nagoya and Greater Tokyo. The demographical center of Sweden (using the median center definition) is Hjortkvarn in Hallsberg Municipality, Örebro county. Between the 1989 and 2007 census the point moved a few kilometres to the south, due to a decreasing population in northern Sweden and immigration to the south. 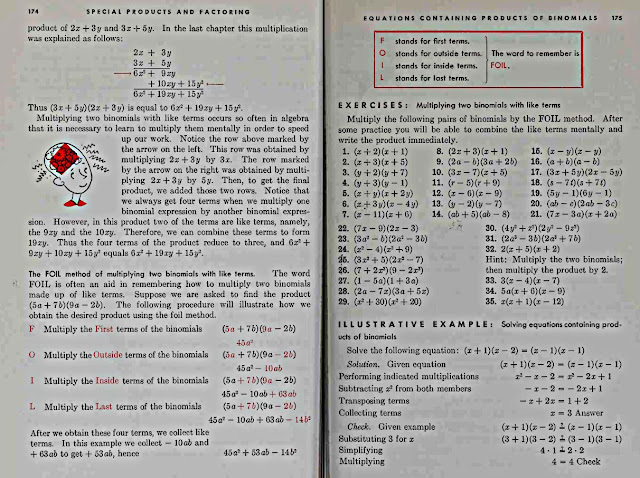 I have been browsing through some articles and books about "commercial" arithmetic and its history. Along the way I realized I had not understood the shades of difference in the meaning of usury and interest. In the middle ages commercial arithmetics seldom discussed compound interest. This was because under canon law it was illegal to charge for the use of money. The Early History of Financial Economics, 1478-1776." While partnerships could be used to disguise the payment of simple interest, the explicit recognition of a ' profit on profit' payment could bring the sanctions of canon law upon those requiring the receipt of such a payment. For flagrant violation, these sanctions could include ex-communication and even banishment. If such payments were made, and there is some evidence that payment of compound interest was a regular business practice at the time of the Treviso, such payments were made in silence. It is obvious from the resurrected documents of Chuquet's "Triparty" that compound interest was known, and used, but never openly until later. was acceptable while usura (from the Latin noun "use") was not. Compensation could be charged for a loan (mutuum) only if it was a reimbursement for a loss or expense, no net gains were permitted." I'm sure most middle school teachers have encountered mistakes like the one in the picture above due to students using an algorithm to replace understanding subtraction. Many years ago I became alarmed when I saw it happening frequently in my Alg II classes on a test question that appeared in a testing program used at the school... it wasn't in my syllabus, but still... these are bright kids. I had always been aware of a few students who were dependent on their calculators for very trivial questions, but in following up on the particular subtraction issue, I became aware of how many of my students had almost no skills in what I call "mental math". In essence the idea was to develop facility with tens compliments and hundreds compliments as part of the pre-development and then use the "roads" to allow something similar to skip-counting, but with variable skipping, to get the differences between numbers. In my high-school classes I dispensed with "number roads" and simply encouraged the use of "linking numbers" to pave the way for counting on. When I met resistance by students who felt they were fully functional with conventional algorithms, I would make them solve a couple of problems with time or distance involving bases other than ten. If they handled these, I would assume they understood and used subtraction well enough to do well with whatever approach they used. I was amazed at how many of the students became fond of challenging themselves with doing the problems mentally after awhile. We would do two or three problems in the review at the beginning of each class and they often became quite skilled. When we had guests and they wanted to show off I would pick a problem which particularly favored counting on, something like 1004 - 397, but it really became unnecessary as they quickly progressed. Their interest gave me a beautiful lever when we got to working with polynomials. I would show that (10x+5)^2 allowed you to mentally calculate the square of numbers ending in five... and 38x42 could quickly be viewed as (40-2)(40+2)... We would continue to the end of the year with a few moments of mental drill each day, and the kids who returned for pre-calc and calculus seemed to retain the skills for the most part. I don't teach Alg II anymore, and still mention mental math once in awhile in pre-calc, but I've never gone back to the regular teaching of mental math skills. I wonder if counting-on is taught in the elementary grades at all, or how subtraction is approached. I did find a UK educational site where the term "counting on" was used to describe an approach very much like what I have taught...and they even have an interactive Excel spreadsheet to teach the method. Subtract joins two easy to understand roots, the sub which commonly means under or below, and the tract from words like tractor and traction meaning to pull or carry away. Subtraction then, literally means to carry away the bottom part. 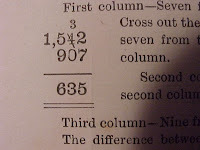 The "-" symbol for subtraction was first used in Germany as markings on barrels to indicate those that were underfilled. Around the 1500's it began to be used as an operational symbol and it became common in English after it was used by Robert Recorde in The Whetstone of Witte in 1557. The term subduction was often used in older English books up until about 1800. John Wallis uses the term in his "Treatise on Arithmetic", 1685 in describing subtraction... "Supposing a man to have advanced or moved forward, (from A to B,) 5 yards; and then to retreat (from B to C) 2 yards: If it be asked, how much he had advanced (upon the whole march) when at C? Or how many yards he is now forwarder than when he was at A? I find (by subducting 2 from 5,) that he is advanced 3 yards. Samuel Johnson's 1768 dictionary defines both terms, but includes "substraction" as part of the definition of subduction. In the same dictionary, Johnson defines both subtract and substract, but for subtraction, the reader is referred to "see substraction" so I assume that was the more common term. The method of subtraction commonly called Borrowing or decomposition seems to go back at least to the 1200s. In The Art of Nombrynge by John of Hollywood (Sacrobosco) subtraction was taught "entirley like the method of today, 'borrowing' and all." [E. R. Slight from "The Craft of Nombrynge, Mathematics Teacher, Oct. 1939]. Robert Recorde used the term in The Ground of Arts (1543) and Denniss and Smith (Robert Recorde, the life and Times of a Tudor Mathematician) describe the term as "a term that had already gained some currency". The word, "borrow" may not have been commonly used until around 1600 as the earliest listing in the OED associated with subtraction is "[1594 BLUNDEVIL Exerc. I. (ed. 7) 91] Take 6 out of nothing, which will not bee, wherefore you must borrow 60." The borrowing of 60 suggests the exercise may have been about time. 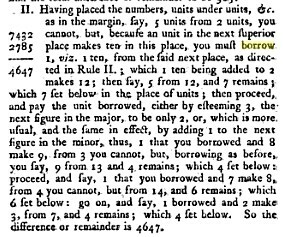 Here is a link with an image of a page from the Arithmetic of John Ayres in 1695 in which the word borrow is used in subtraction, although the method is more like what Ross and Pratt-Cotter (below) call the "equal additions" method. 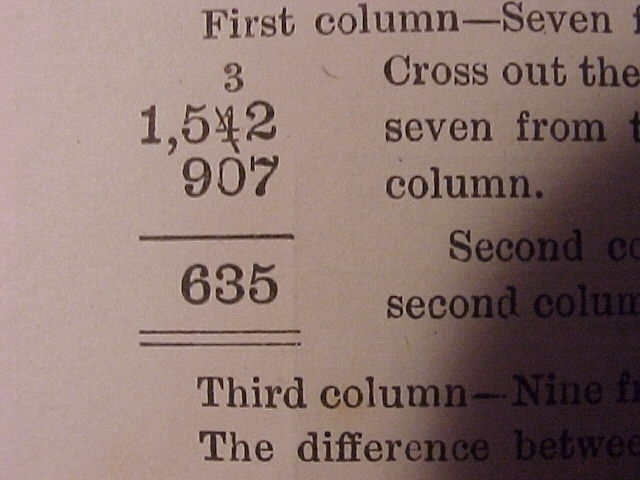 Only one example was found, from a text published in 1857(Ray's Practical Arithmetic), where markings were used to keep track of the renaming process. This was done in only one problem in the text, with all other problems worked without any markings. Brownell was not aware, however, of any textbook employing this technique.
" I entered kindergarten in 1929, ten years before the Brownell article, and while I don't remember distinctly just which grade introduced me to the "borrowing" scheme for subtractions, it was surely in my schoolwork by 1933, probably 1932, in the Ferry School, Detroit, Michigan; and the crutch pictured in Ballew's example was standard procedure for us. We did (and every grocer did, too) the corresponding thing when adding a column of figures, as a grocer would do on his brown paper bag, listing and summing the item prices in a vertical column on the side of the bag before filling it with the items themselves. If the sum of the right-hand column (in cents) was, say 126, he would enter the 6 below the line, as part of the ultimate sum, and enter the 2 above the top of the tens column and the 1 above the top of the hundreds column, etc. 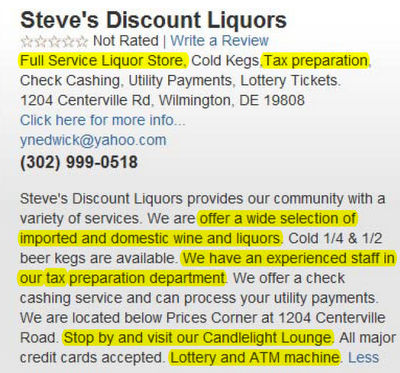 In practical commercial sums and differences the place of the decimal point was implicit (dollars and cents) and disregarded in grocery stores until the end. In school we were careful to make vertical things *beautifully* vertical, and to preserve the decimal points throughout. Of course this made no difference, except to our understanding. Later, probably by the fifth grade, we were encouraged to *imagine* the crutch in a subtraction problem; writing it down was a sign of weakness, akin to moving the lips while reading. I'm sorry I have no documents from that era in my education, but I do know that my work was always supervised by my older brother, who was five years older than me, and he never showed any surprise at anything I did in arithmetic, so I imagine that by 1925 or 1926 he had also been learning to write subtractions (also in Ferry School) in the same way. Some years ago I was studying a facet of the history of the Detroit Central High School in the period 1898 - 1950 (it was debating clubs that interested me, not math lessons, but no matter), and I found that the Detroit Public Library had several archives of random materials of no particular importance that they had filed under the names of certain (dead)teachers, but cross-referenced so as to make it easy to know what they were. How those particular teachers, or their heirs, got these memorabilia into the library I can't imagine, for the files contained only old school newspapers, club meeting minutes, letters and so on, and the teachers themselves had not been notable; but I believe that if you go to any big city public library and ask for archives of local school teachers of a certain era (1900-1940, say), you might find a sheet of homework or a set of exams or answers, written out in that teacher's hand, or a student's, in some one of them. That might tell you more about the arithmetic style of the time than even the popular textbooks would. " It may be that the use of the "crutch" markings were commonly taught, but not found in books because disagreement about whether they should be used. In The Teaching of Arithmetic by Paul Klapper (1934), he gives an example both with and without the markings, and calls the form without the markings the "recommended form --- no 'crutches' should be permitted." The very use of the word crutch seems to confirm Professor Raimi's assertion that the marks were viewed as a weakness to be avoided or overcome. However in the article Klapper states that, "This method is the favorite of many teachers who hold that it is very simple because it can be demonstrated objectively with dimes and cents and that it can be habituated quickly. Others are opposed to it because it requires a second set of number facts -- the subtraction combinations." 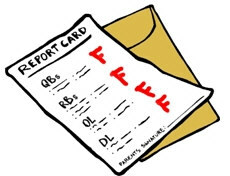 The evidence seems to suggest that the use of a the borrow markings were common in America well before the publication of Brownell, but it may not have been common in textbooks because, as stated by both Professor Raimi and the Klapper book, it was viewed as a weakness. Neyman was invited to Berkeley in 1938. Berkeley, as he put it, was "tabula rasa" - no statistical study at all then existed. None of these deeply rooted London antagonisms: he was getting in at the foundations. Neyman's mention of two unsolved problems, including the Gosset/Student problem, in a Berkeley lecture in 1940, would have been of little consequence had George B Dantzig not been late to that particular class. He mistook the unsolved problems on the blackboard for a homework assignment, and wound up solving both of them. Neyman took the initiative in getting Dantzig's papers published, and thus launched Dantzig's career. Dantzig's discovery is legendary, and Neyman's generous response deserves to be legendary also: not all teachers will tolerate a student who discovers something in their presence, and few of those will take the initiative in getting that student's work published. In the bible stories in Samuel and Chronicles, God sent a plague on the people of Israel because of David's "numbering the people". 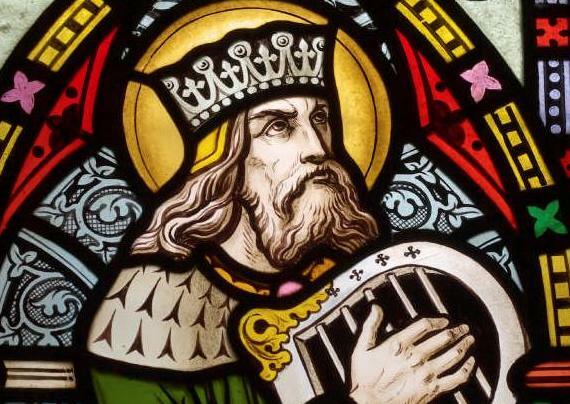 It is not clear what the word meant in this context, or why God was displeased, but thousands of years later religious people fought to defeat the idea of public numeration (census) based on the fear that it would bring God's wrath. "David was conscience-stricken after he had counted the fighting men, and he said to the LORD, "I have sinned greatly in what I have done. Now, O LORD, I beg you, take away the guilt of your servant. I have done a very foolish thing." 11 Before David got up the next morning, the word of the LORD had come to Gad the prophet, David's seer: 12 "Go and tell David, 'This is what the LORD says: I am giving you three options. Choose one of them for me to carry out against you.' "
13 So Gad went to David and said to him, "Shall there come upon you three [b] years of famine in your land? Or three months of fleeing from your enemies while they pursue you? Or three days of plague in your land? Now then, think it over and decide how I should answer the one who sent me." Not sure why God couldn't have chastised David more directly instead of killing 70,000 other folks.... or why his son Solomon was not punished later for a similar counting is not clear, "Solomon took a census of all foreigners in the land of Israel, like the census his father had taken, and he counted 153,600." 2nd Chronicles 2:17. He would have surely known of his father's experience...and he was, afterall, as wise as ....well... Solomon. So why the singular focus on David's sin became so common is unclear to me..but it lasted well into the 18th century. In a letter from John Winthrop to Sir Nathaniel Rich he reported that the people of the Colony had not been formally numbered, by reason of " David's example," but there were believed to be more than 4000 of them. In The "Triumph of Numbers" by I B Cohen he quotes Winthrop letter with the colorful reasonin that, "David's example sticke's somewhat with us." From the same source I found, "In 1712, in a letter to the Lord of Trade, the Governer of New York blamed the imperfections of the census of 1712 on the fear of God's wrath and, in a report, claimed that an earlier count had been followed by excessive sickness in the colony." One of the great lost papers of mathematics was the Progymnasta de solidorum elementis [Exercises in the elements of solids] of Descartes. It is in this paper that he did, or did not, depending on who's argument most impresses you, first give the famous theorem by Euler on the relation between the faces, edges and vertices of polyhedra. In 1649 Descartes went to Sweden to serve as the tutor of Princess Christina. After his death he was buried in Sweden, but his possessions were sent back to France, but the box containing his manuscripts fell into the river. Many of them were rescued, and this particular one was recopied by Leibniz. Afterward, the original seems to have been lost, and Leibniz copy was undiscovered until 1860. The manuscript is unquestionably the first known study of polyhedra. It certainly had something close to Euler's famous V+F=E+2, at least to the modern eye. It was just as certainly not known to Euler or any other mathematician of the period. So did Descartes discover Euler's Gem? Theorem: The sum of the deficiencies of the solid angles of a polyhedron is always eight right angles. It is an almost trivial step from this to Euler’s theorem, that the sum of the plane angles is four times the number of solid angles, less eight right angles, that is 4V – 8 right angles. numerum angulorum planorum invenire: Ducatur numerus facierum per 4, et productum addatur aggregato ex omnibus angulis planis, et totius media pars erit numeris angulorum planorum." .. Given the sum of all the plane angles and the number of faces, to find the number of plane angles: The number of faces is multiplied by 4, and to the product is added the sum of all the plane angles, and the half part of this total will be the number of plane angles. In his "Proofs and Refutations", Imre Lakatos believes that the small step from Descartes to Euler was not so small a step in the period of Descartes. Descartes failed to seize upon the concept of dimensionality that Euler grasped, a connection between the zero dimensional points, the one dimensional edges and the two dimensional faces. The Origin of "Read Euler..."
Some years ago in my high school class I quoted the famous "Read Euler" quote with the preamble, "As a great mathematician once said, ... and then the quote.".. A couple of days later a student mentioned laughingly that another student had thought the quote was created by me (?? ?a great mathematician???). The student paused for a minute and then responded, tentatively, "You didn't..(long pause)....did you?". I was reminded of this because I have recently been learning more about Euler reading articles by Professor Ed Sandifer.. and especially enjoyed a footnote about the origin of the phrase on his article on Euler as a Teacher. Lisez Euler, lisez Euler, c'est notre maître à tous. Read Euler, read Euler. He is the master of us all. Read Euler, read Euler. He is our master in all things. Read Euler, read Euler. He is the teacher of us all. Read Euler, read Euler. He is our teacher in all things. I received a nice e-mail from Dan MacKinnon, a Canadian math/computer teacher (who writes a nice recreational math blog) after my blog about Karl Marx and Mathematics. I enjoyed your short post on Karl Marx's mathematics. In connection with this this story, I was told that politics and mathematics go together surprisingly often. In the early days of Category Theory, this area of mathematics was perceived as "leftist" - even Saunders Mac Lane's famous book, "Categories for the Working Mathematician" used "working" with a slightly political nuance. I was also told that while category theorists were perceived as progressives, set-theorists were perceived as reactionaries. I have no idea whether or not these supposed political distinctions among mathematicians is true today, or if they were ever true. Mathematicians getting in trouble because of their political/religious views is not a new idea... as I found in this old cut from the introduction to a geometry textbook.. In this case, one might suggest that bad politics lead to good math. And one of my favorite math stories is from George Gamow's autobiography and is about the Nobel Laureate, Igor Tamm. a couple of hand grenades hanging on the belt. the error one makes by cutting off Maclaurin's series at the nth term. 'Correct!' said the Ataman. 'Now I see that you really are a professor. As you know, the harmonic series, h=1 + 1/2 + 1/3 + 1/4 + ..= diverges to infinity, but very slowly. For a finite number of terms, the summation is very nearly the same as ln(n). The error in this approximation is considered an important constant in several areas of mathematics and is called the Euler-Mascheroni constant, or more often, gamma and has a value of about .577. I came across a paper by Professor Ed Sandifer that he wrote back in 2007 in which he says, "Sam Kutler, now retired from St. John’s College in Annapolis, once pointed out that there are three great constants in mathematics, , e and , and that Euler had a role in all three of them. Euler did not discover e or , but he gave both of them their names. In contrast, Euler discovered, but did not name , the third and least known of these constants." He goes on to point out that Euler and Mascheroni, who names are both often used for the constant, referred to it as A or C.
According to William Dunham in Euler, the Master of Us All (1999), Mascheroni introduced the symbol γ for the Euler-Mascheroni constant. Dunham's source is "On the History of Euler's Constant," by J. W. L. Glaisher, which appeared in 1872 in The Messenger of Mathematics. In the paper, Glaisher does not specify where Mascheroni used the symbol, but seems to imply it is in Adnotationes ad Euleri Calculum Integralem, which Glaisher indicates in a footnote is a work he has not seen but which is referred to in volume 3 of Lacroix's Differential and Integral Calculus. According to the CRC Concise Encyclopedia of Mathematics (2003), Euler used γ in 1781. Professor Sandifer finally concludes that probably credit should go to an 1835 article by Carl Anton Bretschneider, the first physical source that seems to include the use, but it seems that Bretschnieder also thought Euler had used it first. Here is page 260 from [Bretschneider, Carl Anton, Theoriae logarithmi integralis lineamenta nova, Journal für die reine und angewandte Mathematik, (Crelle’s journal) vol. 17, pp. 257-285, Berlin, 1837]. I do have to disagree mildly with one point in Professor Sandifers paper. It was not Euler who named the ratio of the circumference to diameter of a circle as Pi. I will stand by what I have written before that "The first known use of the symbol π for its present purposes was in 1706 by William Jones, an English mathematician, although it was the use of the symbol by Euler that brought it its permanency." Jone's use can be found in “Synopsis Palmariorium Mathesios”. si diameter alicuius circuli ponatur a, circumferentiam appellari posse ea (quaecumque enim inter eas fuerit ratio, illius nomen potest designari littera e)." My daughter and I were going over science homework this evening. A ball falls for 10 seconds. What is its final velocity? JC: So how fast is the ball going when it hits the ground? RC: Zero. It stops before it bounces back up. JC: Well, how fast is it going just before it hits the ground? RC: They didn’t ask the almost final velocity. They asked for the final velocity. It was a typical -------A 6 foot tall man is walking away from a 15 foot tall lamppost at a ......find the rate at which his shadow is growing. After about ten minutes of the one who "got it" trying to explain, they called me over. So I asked, "Have you drawn a picture?" 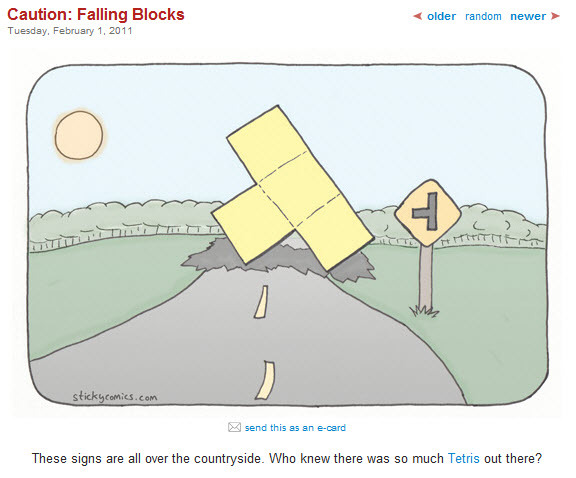 She replies, "That's the problem, how can you draw a picture if you don't know where the sun is at?" Me, confused, "????" THE SUN??? Her.." Yes, the shadow will depend on the angle of the sun won't it? here is a teaser, and a link to the post. Sometimes I inadvertently come up with a math problem and can’t seem fall asleep until I solve it. So it happened last night. Recently alerted by Dave Renfro to a discussion on the Math Forum about the first use of the acronym FOIL for the multiplication of binomials. 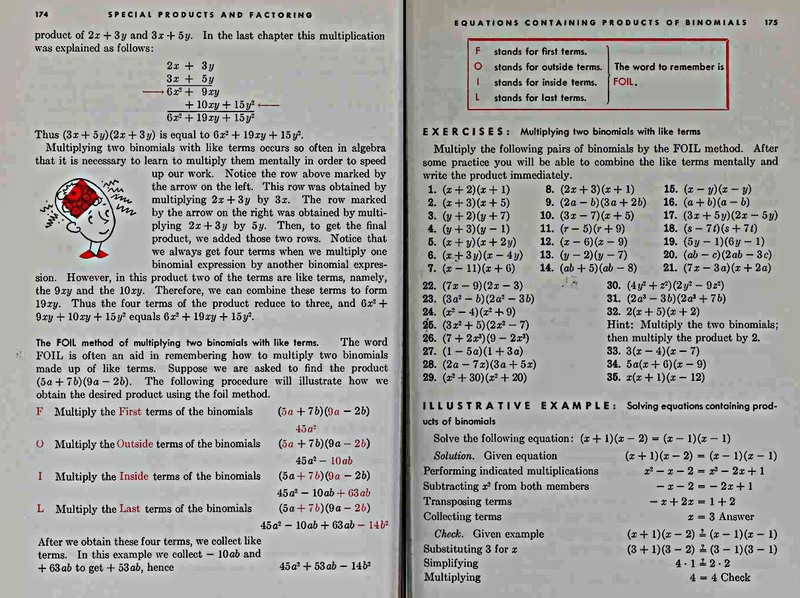 Robert Hansen wrote , "While reviewing Shute's Elementary Algebra book I came across a reference to FOIL during the discussion of products and factoring of polynomials." course: Book 2" from 1931"
" FOIL also appeared 'Algebra for Today' written by William Betz first published by Ginn and Company in 1929. QUOTE "first terms, outer terms, inner terms, last terms. (The rule stated above may also be remembered by the word FOIL, suggested by the first letters of the words first, outer, inner, last.)" 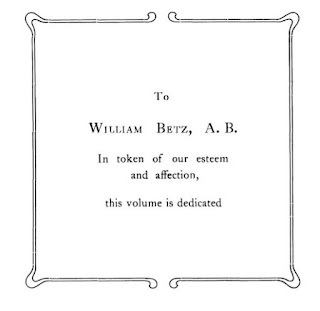 As William Betz had been writing math books for more than a decade by this time, it's likely 1929 was not the first time FOIL was written about." 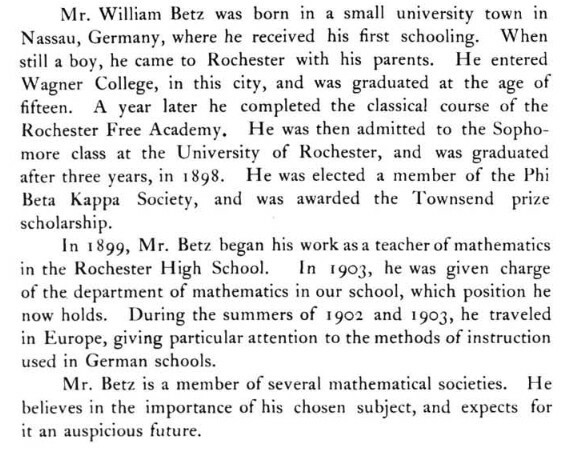 I have renewed my search for the origins of Foil, and a little more about William Betz, which I will add to this as I do not have enough for much of a bio page for him. In 2015 Thony Christie, a very knowledgeable math historian, wrote that he had never hear of the term Foil, and had to look it up. His historical experience, and the fact that he has lived and worked in both England and Germany for extended periods suggest that this was an American creation, not an import. Pat Grew , a Canadian math teacher, was aware of its use; " My intro was in Ontario Curr in '84 as a teacher." Here is an early bio in the Orient, the yearbook of East High School in Rochester, New York where he was head of the Math Dept, and eventually the Assistant Principal as well.. 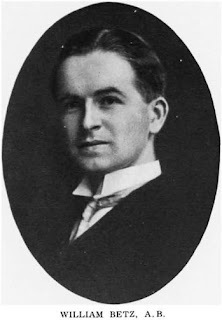 He is also listed in the Admin and Mathematics Dept in the faculty of the 1935 Orient. There is also a Martha Betz listed in the Modern Language Faculty, and a student named Betz on the baseball team picture,(pg 48) but it now seems they were not relations. The 1940 census says he was married to a Elsie Betz, and had two children living in the house. since the oldest was only 12 in 1940. William lived until at least 1959 when he is listed, still at the same address, in the phone book. 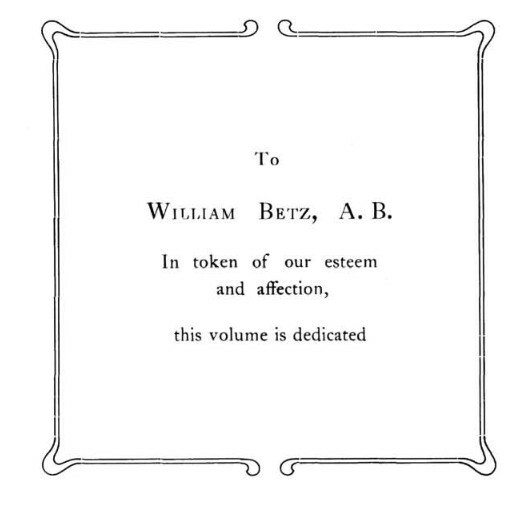 If anyone has an earlier link to this use of FOIL, or about the life of William Betz, please advise. 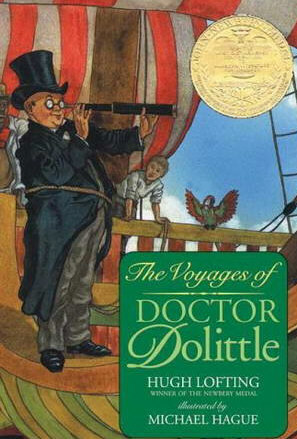 Just came across this quote from Hugh Lofting's "The Voyages of Doctor Dolittle". The Doctor asks his friend Bumpo how he got on at Oxford, and he replies..
“I liked it all except the algebra and the shoes. The algebra hurt my head and the shoes hurt my feet. I threw the shoes over the wall as soon as I got out of the College quadrilateral this morning; and the algebra I am happily forgetting very fast...."
13) Effort has improved: Eyes occasionally flutter open. A shiny "Attaboy" award to Gasstationwihtoutpumps for the correct answer to both Lewis Carroll Problems. Herer is his solution again. Do you have some extra constraints for the second problem to make it non-trivial? For most folks of my generation, raised on lots and lots of factoring problems, the first problem was one of a pair that jumped off the pages of algebra books so often they were almost memorized. The sum and difference of (x+y)2 and (x-y)2 produce the results 2( x2+y2) and 4xy; both of which seemed to occur in textbook problems of my youth. Had Gas... not already told me he had always had problems with memory I would think he had grown up on the same factoring fare and had also memorized them. Perhaps he is more like Dodgeson (Carroll) who apparently wrote about re-discovering this in his diary "towards the end of his life" as he too did not recall it. 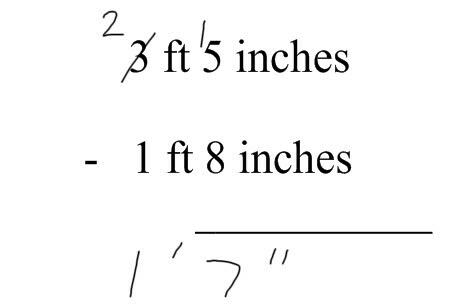 As a puzzle maker, he probably thought the addition of a third multiple would disguise a common factoring and it was this second problem that appeared in his "Pillow Problems". Since my own memory also is very fragile, I was fortunate to find the information in Edward Wakeling's "Lewis Carroll's Games and Puzzles". Carroll also included a somewhat more difficult probability problem in his "Pillow Problems". Since I can't make the first problem more difficult for Gas.... I will give the advanced version of this one. An urn holds B Black and W White balls. One is selected at Random and placed in a bag without your knowledge. Then a White ball is added to this bag. A random draw from this bag produces a white ball. What is the probabilty the original ball was White? Now even my ex-students are trying to hang me up with "Pythagorean-Like" Problems. Today I got these two in an email. Since the problems date back to Lewis Carroll (whom my student's assume I must have gone to school with since I am so very old). I knew the problems and the solutions so I will leave them for now as problems for the reader, and post a solution in a day or two; hopefully with a litlte of the history. They are suitable for HS level so everyone is invited. Feel free to submit your solutions. And the followup??? Prove that three times the sum of two squares can be expressed as the sum of four squares. If one square is inside another with corresponding sides parallel and the vertices of the inner square are connected in order to the sides of the outer square, then the sum of the squares of the distances of the connections from opposite vertices will be equal. For the image below, GD2 + EB2 = FC2 + HA2. We played around at the board for awhile and finally proved it with nothing fancier than the Pythagorean Theorem and simple algebra. My method was to draw a horizontal segment (labled R for right shift) to mark how far the inner square is moved from the left edge of the outer square and then a vertical one, D, for down-shift. Then with lables of L for the large squares side and S for the small squares side (not creative, but easy to remember) I could write the length of all four segments. (DG)2 for instance would be D2 + (R+S2. We expanded out the squares of all the binomials and trinomials (and he corrected me when I wrote D for R or got a negative as the product of two negatives) and then crossed off mathching parts until everything was gone.. the two expansions were the same alphabet soup of algebraic variabless. QED. One student witnessing our work commented that we had covered the board and never written a number. I seized the moment to explain what power that was, and began to expound on the implications for possible generalizations... since L, S, R, and D could be any positive (actually two could have been negative) value, and had no relative order or size, S did not have to be smaller than L... and R did not have to be smaller than L... conclusion??? It must also be true that the squared distances are equal even if the one square is not inside the other. It could be partly inside, or totally outside and either could be larger. For a square and a point on the same plane, the square of the distances from the point to one pair of opposite vertices will have the same total as the square of the distances to the other pair. (Why have I never seen this theorem?... Is it in textbooks?) And I propose that the condition that the point is in the same plane is unnecessary. In fact that seems almost trival since it only adds twice the square of the perpendicular distance from the point to the plane of the square... if my mind is working correctly this morning. If that is true, that also means that for any square based pyramid, the squares of the sums of the lengths of two opposite edges from the base to the vertex will also be equal. what about rectangles.??..... 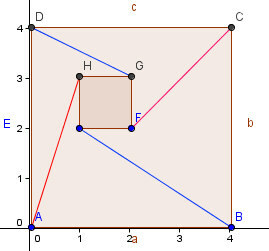 If we inscribe a square in a rectangle, then the degenerate case (the inner square is a point) is still true, but with a square and a rectangle the vertex to vertex sums are not equal... in fact, I have discovered that they will differ by a constant value (no matter where the square is or how it is rotated ) that is equal to the product of twice the side of the square times the diffence in the sides of the rectangle. This property, however, is not preserved when the square is rotated inside the rectangle. I think that there would be a different constant difference for any orientation of the corresponding sides of the square and rectangle (untested wild conjecture). I worked out this "constant distance" and found that the difference is equal to twice the product of the length times the width times the cosine of the acute angle between them, 2*L*W Cos(theta) ("Holy Law of Cosines, Batman!"). I think this proof would be suitable for HS students. Again, there seems there would be no need for this point to be in the plane of the parallelogram. If we replace the square by a rhombus, and sum the squares of the distances from a point to a pair of opposite vertices, I believe the two sums will differer by s^2. I have not had time to prove this yet (offers accepted). While I'm in the mood to make conjectures, If the two squares lie in parallel planes then the sum of squares will almost cerainly still be equal. I imagine a physical construction of the two squares in the plane, with elastic chords connecting the vertices. When I lift one square out of the plane and translate it along a line perpendicular to the original plane I am adding a distance of 2* h^2 to each pair of vertices sum. Since the two squares could have been in any orientation originally, it seems that no special precaution about the orientation of the squares would be needed. This would seem to have application to skew prisms, frustums of pyramids and skew frustums (I'm not sure we have such a definiton in geometry, but I mean a frustum in which one base is not similarly aligned with the other when projected on the same plane. I suspect that if the two squares are not even in parallel planes, the sum of the squares of segments containing alternate vertices will be equal also. No time to attack that yet. A first postscript: It seems that for any even sided regular polygon, the sums of squares of distances from a point to pairs of opposite vertices would be equal also since any two pairs of these opposite verties would form a rectangle. Likewise, if two even sided regular polygons have opposite vertices connected in sequential order, the same property is preserved as for squares. 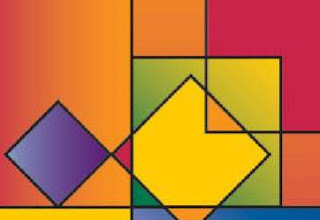 I came across the following beautiful result in Clifford A Pickover's Wonderful Math Book. It got me interested, and so I set out to see what I could find. The article below appeared in The Quarterly Journal of Pure and Applied Mathematics: Volume 2 - Page 38 in 1858. The simply titled article, by an almost unremembered Cambridge mathematician, must rank as one of the most unusual and interesting in all of math. Although demonstrated with a circle, the problem states that if you construct a chord on any closed curve which is smooth and convex, and divide the chord into two lengths p and q, with a point X; as the chord is moved around the circle the point will generate a path that will always cut out the same area between the locus and the outside boundary of the curve.... No matter what shape the original curve was..and that area is the area of an ellipse with semi-major axes of length and q..... yet there is no ellipse involved in the problem. ....Or is there. The motion is reminiscent of a drawing instrument called a trammel. See Archimedes Trammel at Wikipedia. In this image the trammel has the scribe, or drawing point, on the exterior of the two guide points where the theorem above presumes the scribing point is interior to the two guides, but that locus will also form an ellipse when drawn on two straight lines for the guides. Many students may already have seen that ellipse, or at least a fourth of one in illustrations of the Falling Ladder Problem which often shows up in related rates problem in calculus texts. For this illustration a fixed point on a ladder is followed as the foot of the ladder slides away from the wall and the top of the ladder slides down the wall. An interactive image for those who have never seen it is at the Geometers Sketchpad site. 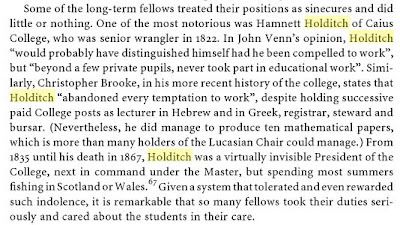 So anyway, it made me wonder about this mysterious guy, Hamnet Holditch. It turns out he must have been incredibly bright. He was Senior Wrangler at Cambridge, and also won the Smith Prize. In England, this is a big deal, and folks make a fuss about it.. they did then, they do now. 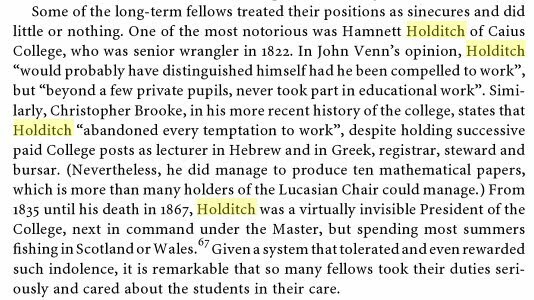 From Mr. Hopkins' Men: Cambridge Reform and British Mathematics in the 19th Century. As it turns out he was from the area of King's Lynn in Norfolk, not far from where I live in the UK. I found a little more about him online. instructed by the Rev. L Coulcher, at the Grammar School.